Anna and Eric Pelletier share a hug in the kitchen of their home at 46 Senior Place in Fairfield. The house was destroyed in a fire on Friday in which their two dogs perished. The voicemail message on Anna Pelletier's cell phone is difficult for friends to listen to: "If you're calling about our house, Eric, Anna, Rudy and Dakota no longer live there. Rudy and Dakota live in heaven now. I do thank you for your prayers and your support. I will always keep the faith." But that's a challenge when mourning the loss of two pets that were more like children, dealing with insurance adjusters in the fire's aftermath, and trying to get on with lives that were already challenged by job loss, pending foreclosure and a planned move out of state. Anna Pelletier was in Arizona interviewing for work last Friday when her husband Eric called to say their house at 46 Senior Place, which was on the market, was severely damaged by a smoky fire and, worse yet, that their dogs had perished in the blaze. Photographs of the house exterior give the impression that the damage was minimal. But those who peer inside the white, two-story house are astounded. "They leave crying," Anna Pelletier said. "It's been a tough day," Anna Pelletier said Monday after walking through the house with insurance adjusters and learning it was a total loss. Tuesday didn't get much better. Their Airedale terriers, Rudy, 2, and Dakota, 3, were cremated. "It's just devastating. You wonder how much one family can take," said Rita Kleinman, of Stratford, a family friend who plans to give the Pelletiers gift cards to grocery stores and a retail shop where they can purchase clothing. She is using Facebook to organize help for the Pelletiers, who have no relatives locally. "We go to bed with tears, we wake up with tears," Anna said Tuesday. The short sale of their house, which was their home for four years, is scheduled for Aug. 23, but at best is on hold and possibly off the table. Their relocation may be postponed until the house issue is resolved. Through it all, the Pelletiers say, their friends, neighbors, church -- Black Rock Congregational Church -- and people they don't even know have propped them up with love, prayers, meals and clothing. "There are so many people we have to thank," Anna Pelletier said, starting with the first responders to last Friday's fire, which the former music and drama teacher-turned EMT appreciates. "The firefighter who found my babies gave them mouth-to-mouth. We have to find that person and thank them for trying," said Anna. However, it may be difficult to track down that firefighter. Since Friday was the day that a Bridgeport fire lieutenant and a firefighter were laid to rest, many Fairfield firefighters were providing mutual aid to cover Park City fire stations, Fairfield's Fire Department was aided by counterparts from Greenwich, Norwalk and Wilton in battling the Senior Place fire. Beverly and Dennis Lambert, the Pelletiers' neighbors across the street, have been very generous, Anna said. They brought over shoes and clothes. "We had nothing. 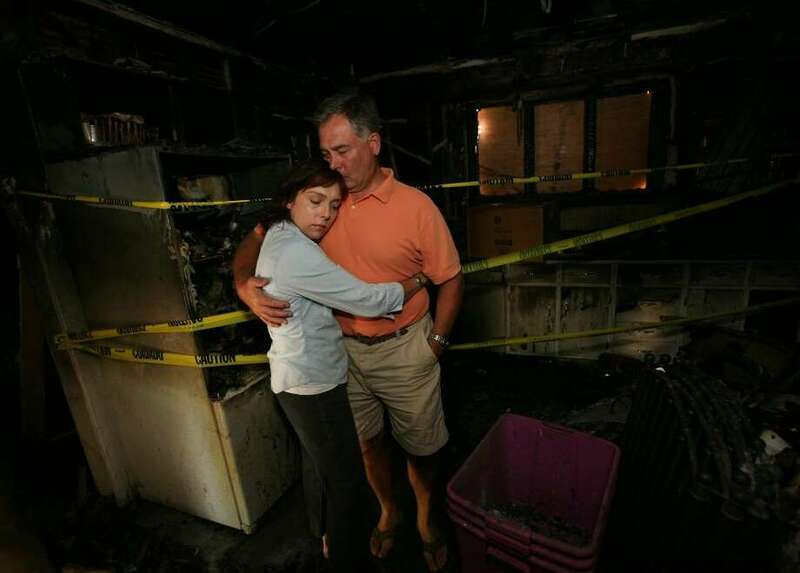 We had the clothes we were wearing," she said in the aftermath of the fire. Several families from Unquowa School, where Anna once taught, stopped by to offer what help they could. One child gave $5 for the Pelletiers to "buy a memory" related to their dogs. Marissa Proto, 10, gave them all the dimes, nickels and pennies from her Christmas jar, coins she saves throughout the year for a worthy cause. A neighbor, Leah Boyle, 11, drew a picture of her black lab with two Airedales walking behind it. "This is going to be put in a frame," Eric said. Anna said people have left notes and flowers at their door. They found one woman kneeling and praying on the front lawn. The couple needs "all the support that they can get and this cannot be done by one person or one family alone," said Jessica Ryan, a parent from Unquowa School, who has brought them meals and toiletries. "Anna was one of our favorite teachers and we were so greatly saddened when she decided to leave the teaching industry in search of another profession," Ryan said. "Their story for the past couple of years has been devastating. They did not need this tragedy in addition." "We need continued prayers and support. We're in limbo. We don't know where we're going to go or how we're going to get there," Anna said. "They are so deserving of whatever kindness might come their way," Kleinman said. Once the forensic investigation is completed. the Pelletiers will have a chance to sift through the ashes. "We still want to go through every ash and tile to see what we can salvage," Anna said. Eric said they hope to find photos and mementoes of their wedding and their dogs. Anna was thrilled that Eric found her Bible Monday and she found a box of notes from the students at schools where she taught: Unquowa, Pear Tree Point School in Darien and Grace Christian School in Stamford. Despite the devastation, the Pelletiers said they are already thinking ahead to better days. Rudy was born on Christmas day and they said they hope by this Christmas to have another Airedale or two from Longview Airedales in Delaware, the same breeder where they got Dakota and Rudy.